To make a short story even shorter, the Mankiw Rule suggests that the Zero Interest Rate Policy will continue for quite some time, barring dramatic changes in the inflation and/or unemployment rates. “The Mankiw Rule” is what I call Greg Mankiw’s version of the Taylor Rule. “Taylor Rule” is now the general term for a rule that sets a monetary policy interest rate (usually the federal funds rate in the US case) as a linear function of an inflation rate and a measure of economic slack. Such rules provide a simple way of either describing or prescribing monetary policy. Unfortunately, there are now many different versions of the Taylor Rule, which all lead to different conclusions. Not only are there many different measures of both slack and inflation; there are also an infinite number of possible coefficients that could be used to relate them to the policy interest rate. In fact, if you ask John Taylor today, he will advocate a very different set of coefficients than the ones he proposed in his original 1993 paper (pdf). Parsimony suggests that a good Taylor rule should have 3 characteristics: it should be as simple as possible; it should use robust, easily defined, and well-known measures of slack and inflation; and it should fit reasonably well to past monetary policy. Also, to have credibility, such a rule should have “stood the test of time” to some extent: it should fit reasonably well to some subsequent monetary policy experience after it was first proposed. The Mankiw Rule has all these characteristics. It uses the unemployment rate and the core CPI inflation rate as its measures, and it applies the same coefficient to both. This setup leaves it with only two free parameters, which Greg set in a 2001 paper (pdf) so as to fit the results to actual 1990’s monetary policy. 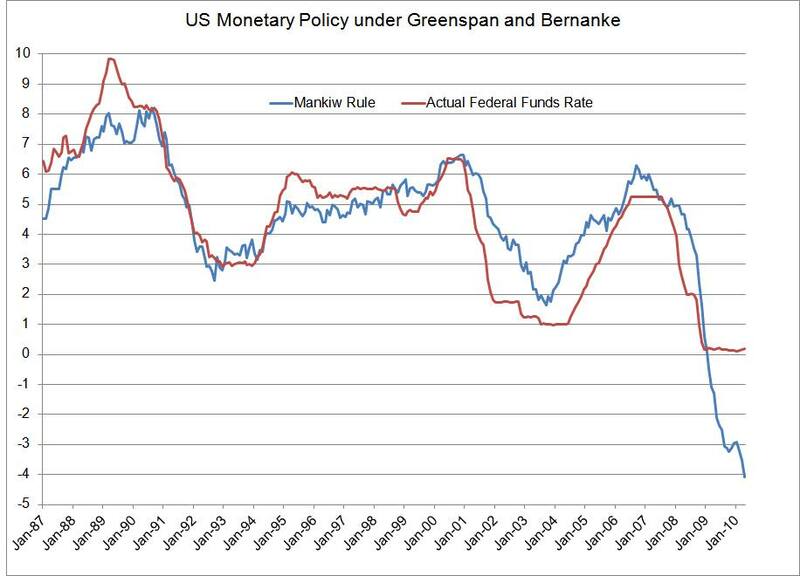 As you can see from the chart below, the rule fits subsequent monetary policy rather well, although policy has tended to be slightly more easy (until 2008) than the rule would imply. You will notice a substantial divergence, however, after 2008, between the Mankiw Rule and the actual federal funds rate. If the reason for this divergence isn’t immediately clear, you need to take a closer look at the vertical axis. Extrapolating from pre-Lehman experience, this chart suggests that the Fed is still doing the best it can to approximate the Mankiw Rule. When banks lend money to one another in the federal funds market, lenders stubbornly refuse to pay for the privilege of lending, and this perversity does limit the Fed’s options. 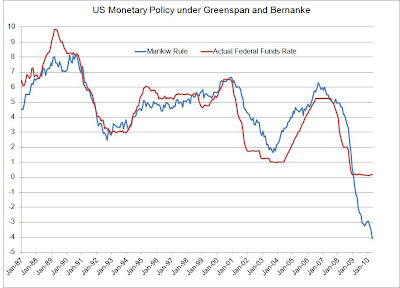 If we wanted to make a guess as to when the Fed will (or should) raise its target for the federal funds rate, a reasonable guess would be “when the Mankiw Rule rate rises above zero.” When will that happen? (Will it ever happen?) Nobody knows, of course, but the algebra is straightforward as to what will need to happen to inflation and unemployment. If the core inflation rate remains near 1%, the unemployment rate will have to fall to 7%. If the core inflation rate rises to 2%, the unemployment rate will still have to fall to 8%. Do you expect either of these things to happen soon? I don’t. How do we amend the Mankiw Rule (or any variant of the Taylor Rule) to account for the impact of quantitative easing? I would think of quantitative easing (as well as fiscal policy) as a substitute for negative interest rates. The Fed (with the help of Congress) has tried to approximate what the impact of negative interest rates would be, so that they can induce a recovery in spite of the zero constraint. But I don't think this requires amending the Mankiw Rule. Quantitative easing is a last resort that should no longer be happening by the time the rule gets up to zero. In fact, we're already perhaps seeing a transition from quantitative easing to quantitative tightening (largely passive removal of prior quantitative easing), as the Mankiw Rule rate starts to turn up from the bottom (or at least, as it's anticipated to do so -- and may have started by the time you read this). There ought to be a substantial period of quantitative tightening before we get to actual interest rate tightening. Actually (to amend my previous comment) it's not clear what constitutes quantitative tightening, and a substantial amount may already have taken place. If you think of the relevant variable as the growth rate of nontraditional Fed assets, that growth rate has already fallen significantly, and such may constitute tightening. If that's the right way to look at things, then it implies that, relative to the Mankiw Rule, the Fed is tightening too soon. Is there a Web site that tracks these numbers and displays this graph, perhaps weekly? You forgot one desirable characteristic of a monetary rule: it should stave off or moderate booms and avoid deflation. I don't know that a regression-based model that fits, or describes, a particular historical period of monetary policy necessarily meets the test of wise monetary policy. Andy, this Mankiw rule reminds me a little of Knut Wicksell's theory of observed interest rate and real interest rate. I know it is not the same but what is your take on that? Also with a seemingly negative real rate of return, even with low rates do you think deflation is a potential issue, or that no matter how low rates can go the economy might be stuck with monetary policy being less effective. Great post, I believe blog owners should larn a lot from this site its really user pleasant…. Isn't this also a critical assumption: "the real return on safe short-term investments averages about 1-2 percent over the long run." Is there anything that says this is constant? What if the real return is negative for a period? In 1979 you had inflation at 13%, but the fed funds rate was at 10%. The reason for this can be the worth you're paying for the convenience, the speed installment loans at that you'll sometimes get your cash, and to encourage you to pay it back on time, and produce a revenue stream for the corporate providing the automotive title loan. wow what a great blog ! love this blog so much. im going to share this to my friends. This is a very good post which I really enjoy reading. It is not every day that I have the possibility to see something like this..
C# Project Help C# Assignment Help, Online C# Homework & Project Help C# project help wanted The "sharp" suffix has actually been made use of by a number of additional. T-test Homework Help, assignment and Project Help, T-test Assignment Help When the scaling term is not known and is replaced by an approximation on the basis of the data. PHP Assignment and Online Homework Help PHP Online Homework Help Intro A server side scripting language is PHP. A structure of PHP shows wavering variables. I know firsthand that top resume writing companies prepare the most unique and winning resumes to their customers. Every of them who has received the CV from them has got a job he has haunted. I’m so excited to find this post, that is amazing. Your content is what I have been searching for! I will be checking your website for updates as often as I visit a resume writing service review toronto. Thanks! this site is really amazing, the content is really great and i'm gonna share this to my friends so they can check this out too. Daftarkan diri anda bersama kami hanya dengan minimal deposit IDR 25.000. Hokibet agen judi bola online dan casino online terpercaya indonesia. Just wish to say your article is as surprising. The clearness in your post is just cool and i could assume you are an expert on this subject. Fine with your permission allow me to grab your RSS feed to keep updated with forthcoming post. Thanks a million and please carry on the rewarding work. Are you looking for mathematics assignment help in Malaysia? Then you are at the right destination. We will provide you help with maths assignment in Malaysia, no matter how difficult and complicated it is. Our professional writers, who are experts in mathematics, can easily solve your mathematics assignment. Excellent and effective blog post. Thanks for sharing. It is refreshing to see someone put so much effort and enjoyment into their blog. Your personal touch will make your blog more entertaining for your blog visitors. I just want to mention I am very new to blogging and truly enjoyed this web-site. More than likely I’m planning to bookmark your blog post . You certainly come with awesome articles. Cheers for revealing your website page. If you are studying in the Australia and looking for the Business Management Assignment help, you are right place because we help the students who face the problems in assignment writing.